One of my favorite Mexican Christmas traditions is Las Posadas. In this tradition, the biblical passage in which Mary and Joseph search for shelter in Bethlehem is re-enacted each evening for the nine nights leading up to Christmas. In my neighborhood, a posada is held on a different street each night. One family will host the posada at their home, but everyone who lives on the street is invited to contribute food, hot drinks, candy, or piñatas. The 16th of December is the night of the first posada. Because this is the first night, it begins with a mass that is held either in the local church or chapel (in this case a tiny neighborhood capillita). Following the mass, the group will form a procession to the home where the first posada is going to be held. Often they will carry candles or small lanterns, and sing hymns or Christmas carols (called villancicos in Spanish). In some cases there are children dressed up as Mary and Joseph leading the procession (sometimes they’ll even have a real donkey to ride), but most often there are figures of Mary and Joseph which are carried at the front of the procession. Upon arrival at the home of the family who is hosting the posada, the group will gather around the front door of the house and sing a special song to ask for shelter. In this song the people outside sing the words of Joseph requesting a place to stay for his pregnant wife, and the people inside the home sing the words that would have been spoken by the innkeeper. At the conclusion of the song the innkeeper consents to let them stay, and the door of the home is opened, and all the participants enter joyfully. Read the lyrics and translation of the posada song. In a traditional posada, once the crowd is inside the home, there is then usually a Bible reading and a religious reflection and some prayers, and then the fun begins. There are several piñatas to break, hot drinks are served, either hot fruit ponche or atole, and something to eat, like tamales, tortas or tostadas are distributed to the guests. Besides the candy in the piñata, all the children are also given loot bags full of candy (to the delight of the children, and this parent’s dismay). There is a festive atmosphere with the whole neighborhood coming together to take part in the celebration. 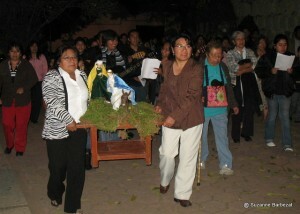 The images of Joseph and Mary will stay in the home where the first posada was held until the following day, when people will gather there again and form a procession to the home of the family hosting the 2nd posada, and the same will take place each night until December 24th, when the images are returned to the church for Christmas Eve mass. 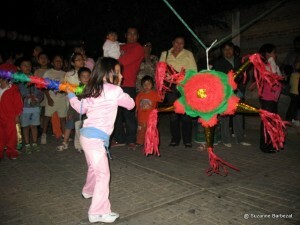 Posadas are great fun for the whole family, and a wonderful way to get into the Christmas spirit. The tradition of holding posadas is celebrated differently in different parts of Mexico, but this is the experience I’ve had of posadas in Oaxaca, and I’m glad to live in a place where the traditions and the bonds of family and community are so strong. Read more about Mexican Christmas traditions. Marca País – Imagen de México, is a joint public and private sector initiative designed to help promote Mexico as a global business partner and an unrivaled tourist destination. This program is designed to shine a light on the Mexico that its people experience every day. Disclosure: I am being compensated for my work in creating content as a Contributor for the México Today program. All stories, opinions and passion for all things México shared here are completely my own. Visit Mexico Today on Facebook and Twitter. ‘Purísimas’ are made for devotion or for gratitude to miracles that persons attribute to Virgin Mary. The families, or a couple of members of a family, realize a “novenario” of prayers to the virgin lasting nine days. Sometimes, the first eight days the prayers are private, but the ninth one is celebrated as described previously, but every family puts a little of their own style. It is interesting how each family inherits the image of the virgin from their ancestors; some of these images have been in the same family over a century.